Every year, the Academy of Nutrition and Dietetics celebrates Registered Dietitian Nutritionist Day in March, during National Nutrition Month. Registered Dietitians are the nation’s food and nutrition experts, committed to improving the health of their patients, clients and communities. 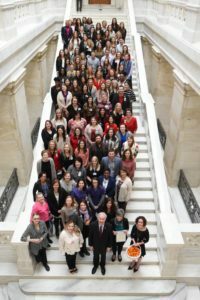 This year, over 100 dietitians gathered at the State Capitol to receive the National Nutrition Month/RDN Day Proclamation from Governor Asa Hutchinson. At the Arkansas Foodbank, we understand that healthy bodies and minds require nutritious meals at every age. However, 1 in 5 Arkansans face inconsistent access to adequate amounts of nutritious food needed to live healthy, active lives. In order to help Arkansans move toward food security and stable health, the Arkansas Foodbank has developed a nutrition policy that focuses on providing more nutritious food and health education in food-insecure communities. Studies show that adults experiencing food insecurity have a higher risk of diet-related diseases. Unfortunately, for many household the healthy foods recommended to help manage these conditions are often unavailable unaffordable in the communities in which they live. However, in addition to providing healthy foods, the Arkansas Foodbank’s staff dietitian and volunteer nutrition educators collaborate with other community-based organizations to promote health and nutrition in the communities they serve.